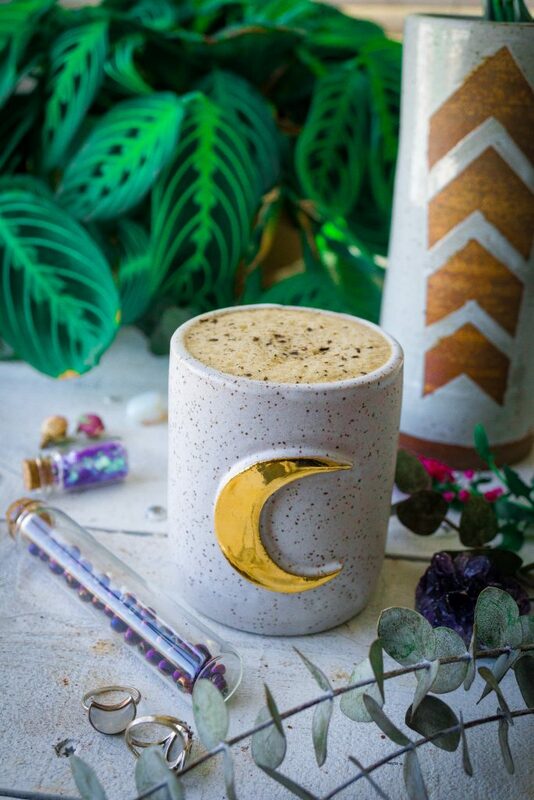 Everyday Adaptogenic Herbal Coffee Latte is creamy, frothy, and delicious. 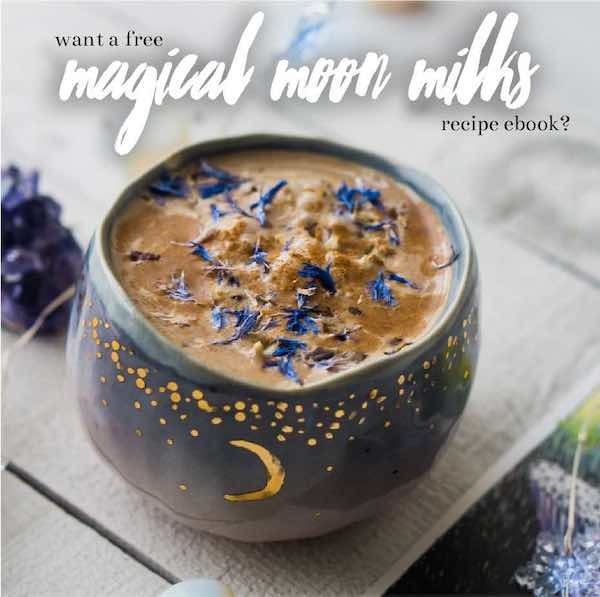 The best part is it is filled with adaptogens. 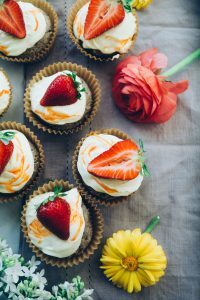 What are adaptogens you ask? They are herbs that help your body deal with stress levels, gut health, adrenals and so on. If you have been following me for the last month you know that I’ve been very into RASA Herbal Coffee Blends. Why am I so obsessed? Well to put it simply is they have 3 different blends, one Cacao Koffee blend, Original Koffee blend, and Dirty Coffee blend. The first two blends are completely caffeine free, the Dirty blend has a bit of organic, fair trade coffee mixed in. 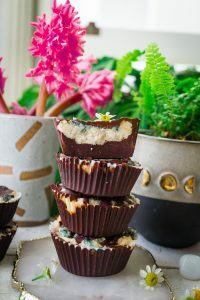 Which blend to use for this recipe? I’ll leave that up to you. I personally buy all three of the flavors in their bundle and pick between blends depending on how I feel on the day. 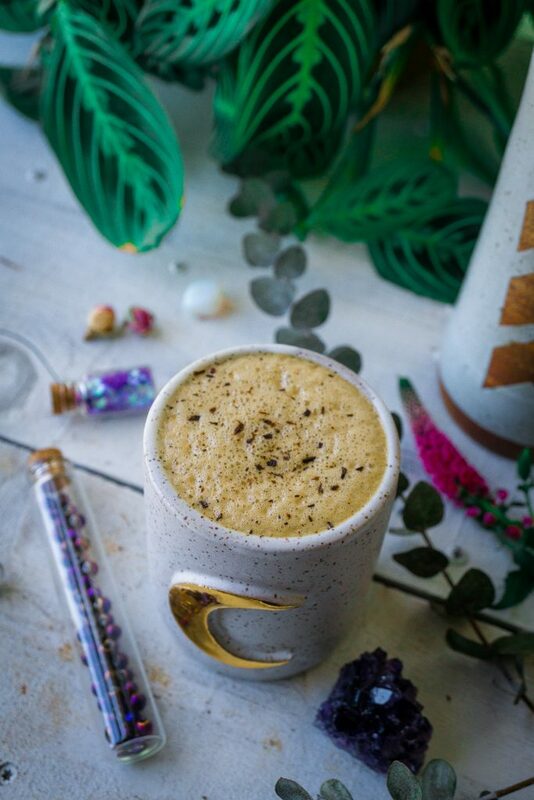 The Cacao blend I will grab for if I am craving hot chocolate with a little energy buzz, the RASA Original Herbal Koffee blend, I grab most days as I don’t need a lot of caffeine. The Dirty Coffee blend, I drink only as when I need the extra energy boost. The Dirty Coffee blend, honestly has changed my life, and perspective of coffee altogether. Since the Dirty Coffee blend has Coffee mixed with adaptogens, it is a miracle that I can drink it. As all of my life, I have been too sensitive to enjoy coffee, I would end up with heart palpations, anxiety, and major depression. Somedays I will even put a half tablespoon of the coffee blend and half of the original coffee blend, you can mix any of them. Or just stick with one, whichever is your style. 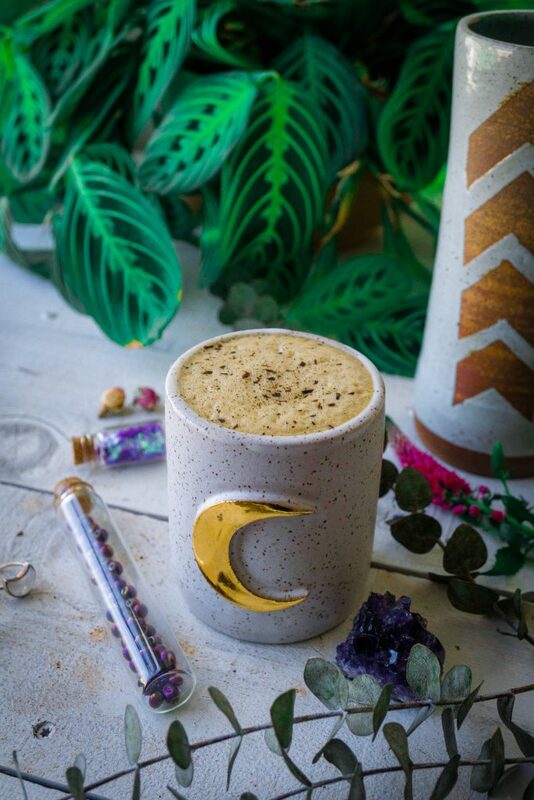 Another thing that I love about RASA is that I don’t have to think about which herbs or adaptogens I am out of. I don’t have to travel or carry around all of my jars with me. It’s all in one, and so easy to use. 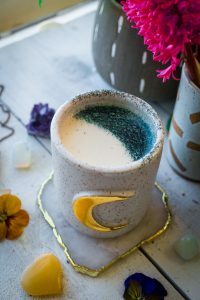 Which is especially important when it comes to adaptogens as it is crucial that you have an everyday relationship with them. Meaning make sure you take the same ones daily in order to see any effects, on your energy, stress, health, and wellness. 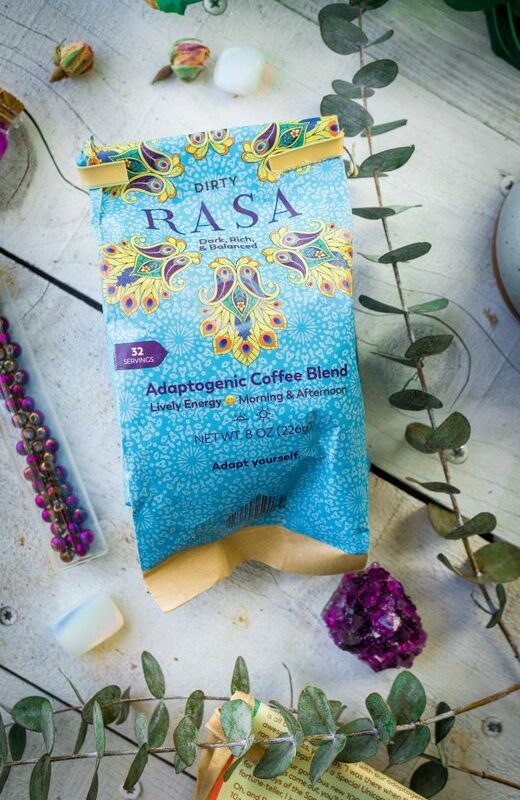 What adaptogens are included in RASA and what are they good for? Ashwagandha – an ancient medicinal herb, can reduce blood sugars, anti-cancer properties, may help reduce, stress, anxiety, and depression. Burdock – can improve your immune system, lower blood pressure, heal a damaged liver, and even prevent or treat cancer. Chaga – reduces inflammation, boosts the immune system, enhances liver health, and fights viruses. In addition, some proponents claim that chaga has anti-tumor activity and can help treat and/or prevent some forms of cancer. Chicory – Chicory root is a good source of inulin, a type of prebiotic fiber that has been linked to increased weight loss and improved gut health. Cinnamon – lowers blood sugar levels, and known to reduce heart disease. Codonopsis – awakens the spleen and lungs so that it’s natural energy is restored. Dandelion – is known for aiding and cleansing the liver, and immune booster. Eleuthero – increases endurance, reduces fatigue, boosts immunity, for overall longevity. He Shou Wu – promotes healthy aging and treats a variety of conditions, including diabetes, cancer, and heart disease. Reishi – enhances immune function through its effects on white blood cells, which help fight infection and cancer. This may occur primarily in those who are ill, as mixed results have been seen in those who are healthy. Rhodiola – increases your body’s resistance to stress, allowing you to better cope during stressful times. Shatavari – helps you reap it’s antioxidant and immune-boosting benefits.